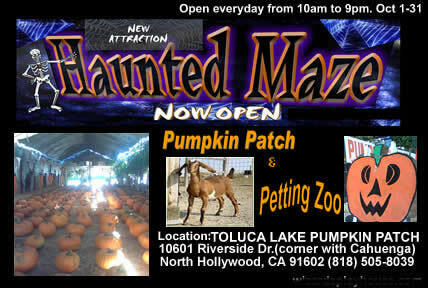 Every year, the Toluca Lake Florist turns into the Toluca Lake Pumpkin Patch during the month of October, offering Halloween cheer in the form of a petting zoo and a simple haunted maze. You will find pumpkins of every size for your Jack O'Lantern needs, along with carving kits. While parents are shopping for just the right pumpkin, children can play with ducks and goats in the petting zoo or take a walk through the maze, which is mild enough for even young visitors, especially by daylight. Overall, a nice place to bring the kids for a fun but not too fearsome Halloween experience.